Here comes the Spring 2011 newsletter! • Signs of Spring – Travelers choose the railroad over the roadway. 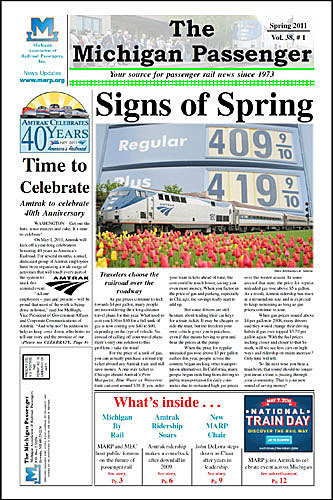 • Time to Celebrate – Amtrak to celebrate 40th Anniversary. • Michigan By Rail – Michiganders gather to discuss the future of passenger rail. • Not So Fast – Michigan not on list to receive additional high-speed rail funding. • Firearms Allowed – Passengers allowed to bring handguns aboard Amtrak trains. • Expanding the Fleet – Next generation of passenger rail cars and locomotives to be built. • Sold – Grand Rapids sells land for Amtrak rail spur. • Plans Underway – Clare depot to be moved. • Blizzard of ‘11 – Snow storm disrupts Amtrak service. • Breaking Ground – Pontiac to build new train station. • Back on Track – Amtrak ridership makes a strong comeback in 2010. • Michigan Northern Arrow – Traveling to Northwestern Michigan in Style. • Turning back the clock . . . – MARP looks back at Michigan‘s past passenger rail operations. • Changing of the Guard – A new era begins for MARP’s Executive Committee. • Wait a Minute . . . – Notes from MARP‘s Membership Meetings. • Chairman’s Corner – “Easin’ on Down the Track“.